Our sweet Community Partners Bill and Trish Morris are at it again! They are creating incredible gifts for 36 years that make children smile. As the owners of Creative Crafts in Temple, they have donated several smiles to McLane Children’s in the form of homemade cars, trucks, pillow cases, and crafts. 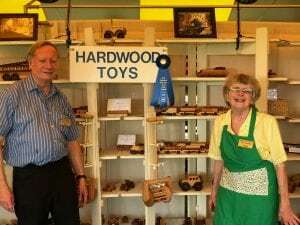 We are so excited for their recent accomplishment of a blue ribbon at a recent arts & crafts festival at the Amish Acres in Nappanee, Indiana. They received Best in Crafts out of 300 vendors! Congratulations and THANK YOU for all that you do for our children. Previous post: Stars meet our stars at Comic-Con! Next post: TMEA bakes treats to benefit McLane Children’s!